Canvas Art Print "Poppies in the solar glare" - and other canvas prints from Poppies category will decorate your interior space in original way. They are mostly used to decorate home (sitting room, bedroom, kitchen or dining room), they give great effect also in other interiors like: offices, restaurants or waiting rooms. 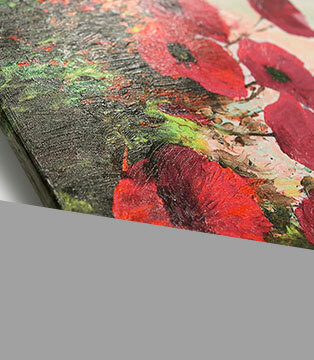 "Poppies in the solar glare" canvas painting consists from 2 parts. Amazing, red pattern will surely match to interiors , which are in similar colours. 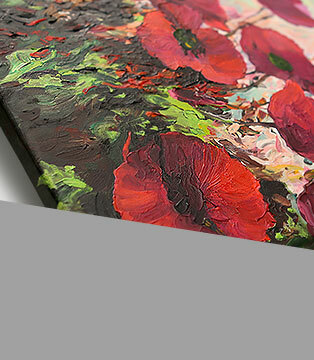 "Poppies in the solar glare" canvas print will be great as a gift for every home decoration lover interested in motifs like: nature, flowers, plants, poppies, handmade paintings, canvas print, canvas art print, paintings on canvas and paintings. 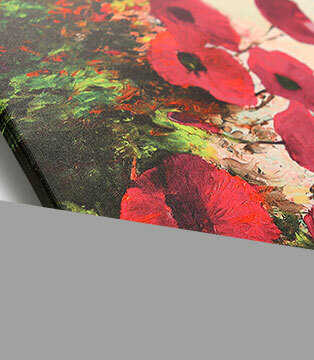 Products from bimago gallery are available in form of canvas printed by Premium Print technique, digital canvas print or hand painted canvas made by our artists. "Poppies in the solar glare" canvas art printproduced using Premium Print technique with gel liner will give "Poppies in the solar glare" unique, artistic look. Canvas Print "Poppies in the mist"
Canvas Print "Poppies in the wind"
Canvas Print "Poppies in the sky"